The Long Beach Island Regional economy has long been powered by family business, join the chamber at their September breakfast dedicated to recognizing the rewards and challenges of couples building a business together. SHIP BOTTOM, N.J. - Aug. 10, 2018 - PRLog -- Sharing the dream of creating and building a business is something most can relate to, but to make it succeed on a daily basis is a process. The Southern Ocean County Chamber of Commerce September 12 meeting will be held at the Mainland Holiday Inn with registration beginning at 815am. The popular Innovate and Caffeinate style format includes networking, breakfast buffet and program featuring local businesses sharing their experience as well as access to SBA family business specialists to assist with new lending programs. Cost is $25 with RSVP or $30 at the door. The panel will include Charlie and Chelsea Kulp of Shore Brake Cyclery, a full service bicycle repair, sales and rental shop located in Brant Beach and Jennifer and Ted Saropoulos of Lefty's Tavern and Restaurant in Barnegat and are defending Chowderfest Grand Champions in the Manhattan Category. The topics will highlight coming to the decision to open a business, balancing responsibilities of home and work, the importance of role clarity, and extending personalities into the culture of the business. Stockton University's Professor John Boyle is back to lead the discussion. He holds an MBA and is a Certified Public Accountant and teaches Accounting and Taxation. In addition to his academic background , Professor Boyle has years of experience serving family businesses in the private sector. The event will also be a resource for those looking to start or expand their business, as the US Small Business Administration will have family business lending specialists available before and after program to assist with questions and financial needs. 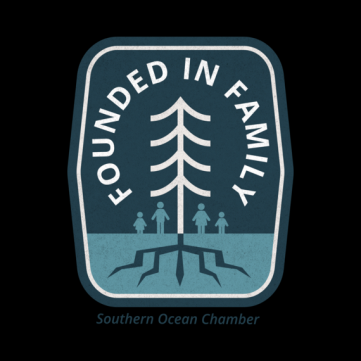 The Southern Ocean County Chamber of Commerce partnered with Stockton University when it launched its Founded in Family Program in 2017 as part of its Vision 2020 strategic plan. This is the first business program in the state created to enhance the family business dynamic. The goal of the program was to allow family businesses to advance in planning stages, encourage new business and provide a platform for family legacies to be shared. In addition to the forum, Founded in Family programming offers workshops and feature articles sharing local family business stories. Advance registration is recommended, as this is a popular program. $25 with rsvp to 815am event held at The Mainland/Holiday Inn 151 Rt 72 E Manahawkin. To rsvp contact Southern Ocean County Chamber at 609 494 7211, email at info@sochamber.com or stop in to 265 West Ninth Street in Ship Bottom.